Bonnie Mielke's face lit up as she spoke about her love of horses. She was at the Mukwonago Community Library wearing a jacket with the name of her horse, Loki. 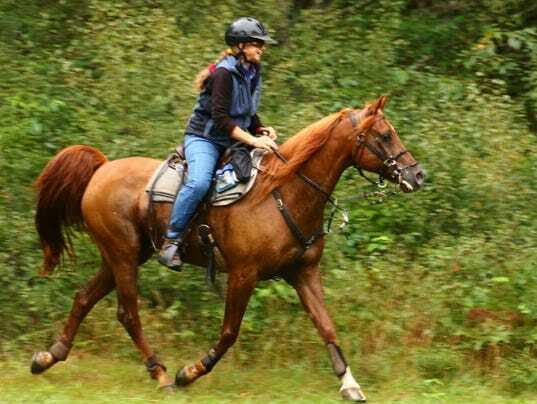 Loki is a fifth-generation of horses Mielke has trained to do long distance riding. Mielke became involved with the sport in 1974. The retired Mukwonago teacher recalled growing up on a farm and hearing her mother talk about horses and cowboys. She wanted a horse but her family was of limited means. Mielke's dad told her to finish college and buy a horse herself after she had a job. She quipped, "So I did." She purchased a horse named Mitzi, an unregistered Arabian, because she was beautiful. Mitzi was Loki's great-great-grandmother.